St. Joseph Institute for the Deaf is committed to listening and spoken language education, spiritual and emotional growth, and personal development of children and young adults who are deaf or hard of hearing, without discrimination, reflecting the values and traditions of the Sisters of St. Joseph of Carondelet. St. Joseph Institute for the Deaf was founded in 1837 when six Sisters of St Joseph of Carondelet arrived in America from Lyon,France. Sent by the Bishop and a dedicated supporter, their sole mission was to educate children with deafness. They began teaching sign language in a small log cabin on the banks of the Mississippi River. Their ministry grew and by 1908 they purchased a school building and established residential housing for students from across the nation. 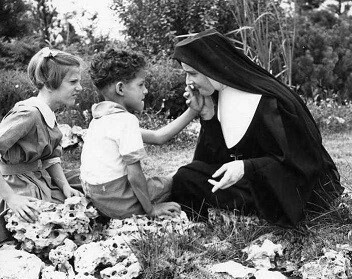 Building on the Sister’s focus of “serving those that are otherwise unserved”, the mission continued to grow. 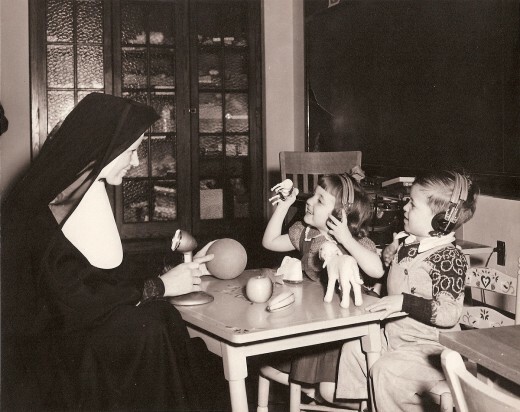 By the 1930’s, the Sisters were known nationally for their expertise and devotion to deaf children resulting in a move to a larger building to accommodate all of the children in their care. 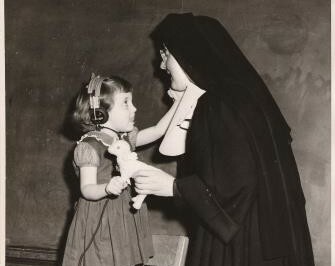 Aware of the technological advancements in hearing assist devices, the Sisters made a dramatic shift in their educational method and switched from teaching sign language to teaching children how to listen and speak. This significant change in educational technique, once again, established the Sisters as true leaders in the forefront of deaf education. As time went on, the Sisters were among the first educators to offer family-centered early intervention for infants, curricula and methodology that focused on cochlear implant rehabilitation, and most recently advances in telepractice. Over the years, deaf education has grown and changed much to the profound influence of the Sisters of Carondelet. Their educational leadership, in conjunction with the rapid advancements in amplification technology, has created a world for today’s deaf and hard of hearing children that is very different. If children now have access to the world of sound, they also have the ability to learn to speak.